My Work SpaceOriginally uploaded by ScruffyNerf. 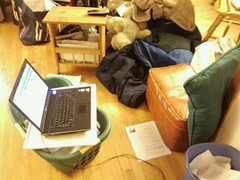 This is currently the space that I am using to do my homework – and other computer-based stuff. My husband and I threw out our living room furniture this morning. We successfully purchased a new sofa and over-sized chair (with two ottomans). I am sitting on the old, orange ottoman that you see in the picture doing homework waiting for the delivery. I am a bit amazed that we actually bought new furniture today at around 2:50PM and that it will be delivered sometime tonight. It could be as late as midnight, but it will come. Wow! Meanwhile, I can say that this set up is not optimal. My back is killing me. Did you notice my laundry basket full of school work? This is the sacred repository for all of my paperwork relating to my research project. I’m not really sure how it ended up in this basket, but am pleasantly surprised by how well it works to contain my supporting documents. Hopefully, the new furniture will help to conceal the laundry basket from general view. What ever happened to the check-out cards left in the back of your books when the library automated? Did they become an “Object of Desire”? Check out this story of a library where these cards became something of interest to some 2nd and 3rd graders and the theft ring that formed around these cards. Warning – this story made me chuckle. After several years of working in library systems, I have come to the conclusion that the most challenging, difficult and frustrating part of my job comes from the fact that I am responsible for my library’s website – and assorted web-based systems. Currently, the college where I work is in the midst of both a website redesign and a migration to a content management system. Because of this, the usual love/hate relationship that I have with this part of my job responsibilities is more of a hate/hate relationship – which has created vast amounts of stress, some questioning of my career choice and eye strain from spending too much time looking at code. This is all a rather large headache that is consuming almost every waking moment of my life (except for that which is being consumed by my ILS680-Evaluation & Research project). I have been spending an exorbitant amount of time and effort on producing something that may well be inherently flawed. After all, how can we build effective library websites when we have little understanding of what this even entails? Can we ever have effective online presences when we piece together disparate systems and fit them into existing architectures? Do we know what our goal is? I have been wrestling with these questions for a long time, and it scares me to admit that I don’t have a good idea of how to start answering them. For me, website design, creation and management seem like add-ons or secondary responsibilities. I do general maintenance on a regular basis and spend more time doing design or creation when we add new systems or services. However, it isn’t until outside forces converge in the form of a college-wide-website-redesign project that I spend any significant time on the library website. And even then, this process seems to be one where I try desperately to carve out a niche for the library website from a project that is driven by forces with vastly different needs and goals. Thus, the end result is flawed before it even comes to fruition. So, this is where my head is at right now. I’m immersed in carving out a niche from a market-driven redesign project with templates that were not created with the library in mind. I’ve been trying to figure out where to go from here – how to figure out the right way to move forward. Fortunately, a post from Lorcan Dempsey’s weblog, An effective web presence?, offered some insight. There is a link in this post to a Library Web Consultancy document prepared by the University College Dublin Library. The library wants to get a sense of the context into which the library website should fit. This is a step they are taking in advance of even thinking about a redesign project. They are hoping to understand their entire online environment and how the library fits into it. They are also trying to figure out how they want their website to work for 2-3 years into any redesign. This seems like a very well thought out project that aims to truly figure out how to design an effective online presence. I can only hope that the people at the University College Dublin continue to post information about the process. I know that I could learn quite a bit from what they find out – and maybe, in time, come to embrace my website job responsibilities. You are currently browsing the Life as I Know It blog archives for March, 2008.